Bigger Blooms that Keep Coming Back! 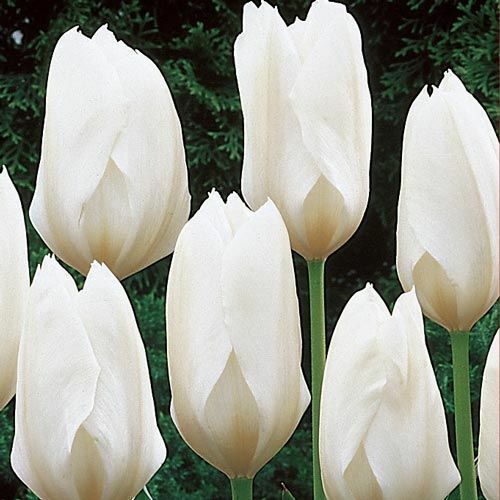 Look how Breck's Wow!® Perennial Tulips compare to traditional tulip bulbs. After five years, they are still going strong. 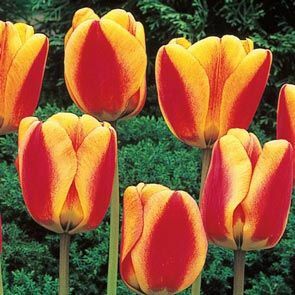 These exceptional Darwinhybrid varieties thrive in sun to part shade and even perform well in Southern gardens where most tulips find it difficult to survive. First of all, these are perennial tulips. Unlike most tulips, which grow and bloom with vigour for only a few years, Holland's Wow!® Perennial Tulips have many of the characteristics of fine daffodils. 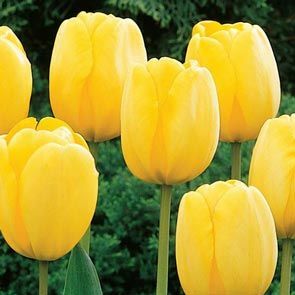 They will bloom in garden with increased vigour and beauty year after year. But that's not all! 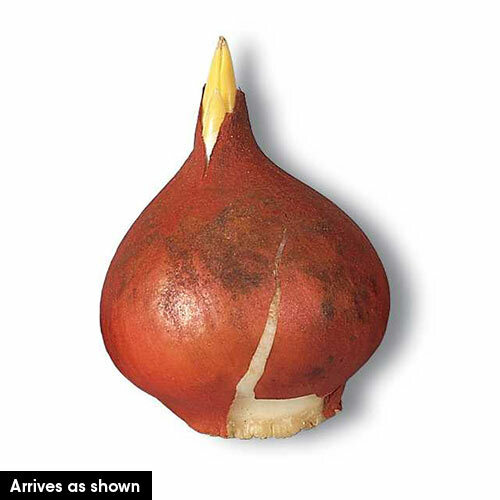 The Wow!® Perennial Tulip bulbs we've chosen are unusually large — 14 cm or larger. These big, plump, healthy bulbs produce vastly superior blooms. Fewer than one in a thousand perennial tulips grow to this huge size. 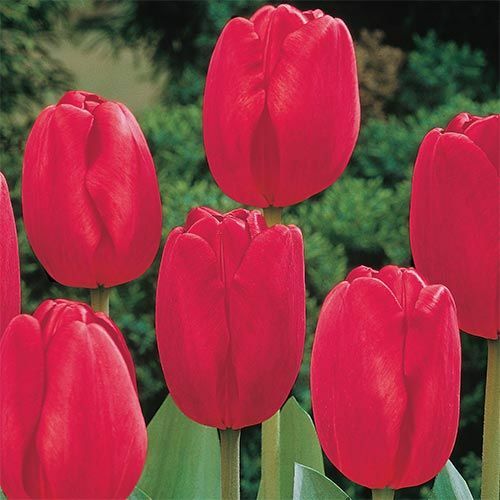 Red Dynasty™: Nature's perfect complement to the colours of springtime, this big, bold adventurer will bring an air of grandeur to a garden or bouquet with its brilliant, colourful blooms. Robust, signal red blooms appear in mid spring on durable, 24-26" stems. Sun Gold: Golden-yellow splendour for your garden or bouquets, this jewel sparkles like a radiant sunbeam against the lush, deep greens of mid spring. 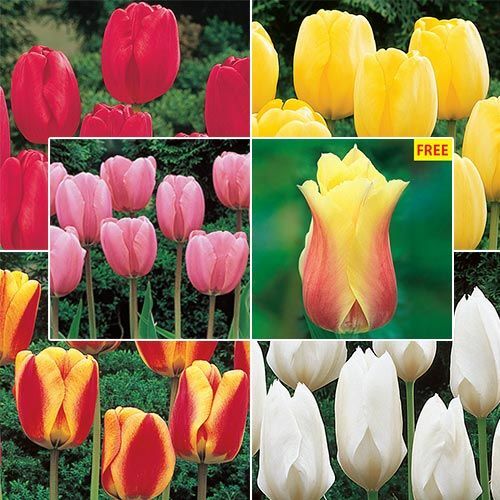 It's a prolific and long-lasting bloomer, supported by sturdy, 24-26" stems. Halley's Comet: Mesmerizing colour and contrast are this showstopper's claim to fame. Brilliant yellow blooms blaze with flames of deep red atop strong, 22-24" stems in mid spring, making this an ideal choice to chase away the wintertime blues. Purissima: As pure and pristine as fresh-fallen snow, this lustrous white beauty will awaken your garden from its long winter's nap. Early to mid-spring blooms on 16-18" stems provide the perfect contrast for the vivid colours of its companions. Guinevere: Like its legendary namesake, this fabled queen is renowned for quiet beauty, strength and elegance. 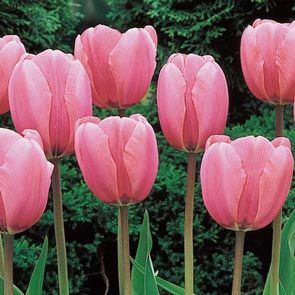 With dramatic pink blooms perched majestically atop 24-26" stems, it's a touch of royalty for your mid-spring garden or bouquet. Plus, 1 FREE Towering Prism Tulip with every collection you order we'll send you one rare, giant size Towering Prism bulb. This enormous bulb - a full 14 cm or larger - will grow with vigour in your garden, producing a tall (over three feet tall! 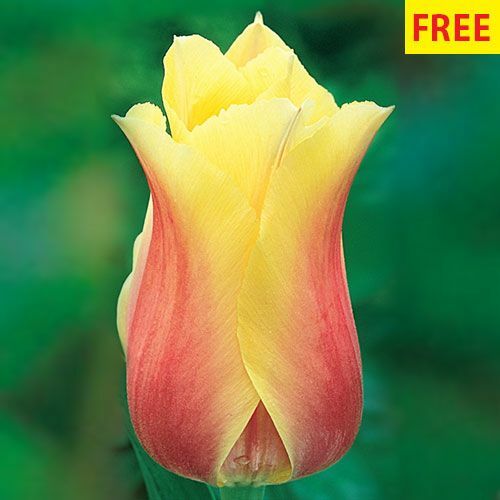 ), chalice-shaped flower with a beautiful pink blush, fading into a yellow trim. Enjoy all 51 bulbs for one low price!